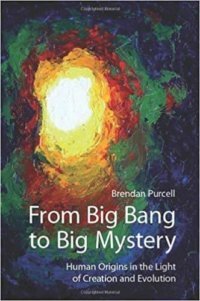 From Big Bang to Big Mystery: Human Origins in the Light of Creation and Evolution. Brendan Purcell. New York: New City Press, 2012. This excellent book repays individual study but in my experience it is also an ideal volume for bringing order to group discussions in seminars. It provides a solid basis for philosophical inquiry into questions of origin about which the average person is intrigued but about which they feel uncomfortable due to the wide variety of specialized knowledge required to constructively explore human origins. Because the book concisely bridges this knowledge gap for the interested general reader, I adopted it as one of the required course textbooks for my upper-level undergraduate philosophy course in Philosophy of the Human Person. I assigned the book to be read over the course of four weeks, and our class met once a week, for three hours each week, to have seminar discussions about the assigned reading. The first week covered the Introduction and Chapters 1 to 3 (i.e., I assigned pages 15–106), which took us through what myth, philosophy, revelation, and science each have to say in complementary ways about the human and also about nature. This non-ideological breadth of vision for which Purcell argues at the outset thus sets the stage for further inquiry. The second week covered Chapters 4 to 6 (pages 107–185), which focus on the details of what science has to contribute to understanding the evolution of the human species. The third week covered Chapters 7 to 9 (pages 189–268), which study seven special aspects that pertain to the human phenomenon: (1) genetics and the notion of “Adam and Eve”; (2) how “human culture is built into our body plan”; (3) the human brain and vocal tract as “meaning-oriented”; (4) human symbols; (5) human language; (6) human understanding; and (7) human freedom. The fourth week covered Chapters 10 to 11 (pages 269–332), which discuss humanity’s fundamental orientation to transcendental horizons (truth, goodness, beauty, meaning) and thus to communion with one another. Chapter 4 on “Darwin and the evolution of evolution” begins with a study of “Darwin’s mixed legacy” (section 4.1). Purcell notes that “Darwin’s scientific strength” (section 4.1.1) is his shifting of science’s concern from mechanist explanations to developmental explanations, and Purcell quotes Bernard Lonergan’s claim that the Origin of Species is “the outstanding instance of the employment of probability as a principle of explanation” (108). But because Darwin failed to distinguish natural science from natural theology (section 4.1.2), he inserted gradualism as an aspect of his theory, and did so not on the basis of data, but ideologically, in order to prevent “the intrusion of a Paley-esque divinity-within-the-process” (113). Still, Purcell notes in Darwin an “awareness of ontological order” (4.1.3) because, although Darwin did not see species as the result of Design, he still maintained that on the whole he could not “look at the universe as a result of blind chance” (115). Nonetheless, after Darwin, Darwinism goes on to function as a “secular religion” (section 4.2), and Purcell dissects this “evolutionism” as the “biological version” of scientism, showing its incoherence in Richard Dawkins (118). Along the way, Purcell quotes a hilarious passage from Kurt Vonnegut’s Cat’s Cradle lampooning scientism for reducing “the secret of life” to “something about protein” (116). Purcell is equally critical with intelligent design (ID) theory (section 4.3), pointing out that ID fails to distinguish primary causality from secondary causality (120). But he does credit ID with rightly objecting to two dogmas of Darwinism: namely, its unwarranted insistence on gradualism, and its misuse (at least in some popular presentations) of the idea of randomness (122). In an overview of how evolutionary theory has evolved (section 4.4), Purcell keenly notes the importance of the notion of exaptation, i.e., how structures “developed for certain purposes can be co-opted” for other purposes in later developments (125 n.109), since this helps us appreciate “punctuated equilibria” as a scientific description alternative to the gradualist dogma: “science doesn’t offer a picture of development, but grasps relationships between data” instead (125, section 4.4.1). Knowledge of the “Cambrian explosion” illustrates the importance of the internal genetic organization of organisms because environmental adaptation is insufficient to explain the phenomenon (127, section 4.4.2). Factors relating to the evolution of both ontogeny and phylogeny, i.e., both genetics and natural selection, must be admitted (125, section 4.4.3). Hence evolutionary theory now embraces regulatory factors (internal genetic evolutionary development, and also convergence) as well as external Darwinian gradually adaptive factors (130, section 4.4.4). Moreover, “psychic factors could also drive morphological development in animals,” as Terrance Deacon, for example, has shown (133, section 4.4.5). All the factors involved can thus be grasped philosophically with the old notions of “matter” and “form,” where the former is the lower level of “emergence” to which there is the latter, higher level of “correspondence” (and “exaptation”: cf. 184), so that “finality” is understandable as the “upward dynamism” in meaningful natural sequences (136, section 4.5). Internal genetic factors, external adaptational factors, constraints on their interaction (“convergence”), and psychological factors are all involved in the evolutionary framework. Because of this complexity, Purcell calls for an attitude “generously open” to multiple angles and approaches to the truth of evolution, and thus endorses an ideal of “non-interfering” approaches, to replace Gould’s proposal of “non-overlapping magisteria” (137, cf. 143, sections 4.6.1–2). Quoting Aquinas (Summa contra Gentiles III, 70), Purcell shows how all the diverse approaches are complementary (139–140), and discusses how Aquinas himself in principle recognized as much, as is illustrated in Aquinas’ many fine philosophical distinctions, such as the distinction between creation (which an eternal universe still requires) and a beginning in time (141). Chapter 5 goes on to explain how the lower levels of the hominid sequence “materially enabled” us to become human (cf. esp. 168–9). Here Purcell brings the material apta (“matter suitable . . . for a higher form”) of traditional philosophical reflection into conversation with the evolutionary notions of “pre-adaptation or exaptation” as describing “the lower levels providing the matter for the formally higher level” (170). In sum, science shows we humans come from diversity. Chapter 6 reviews how paleoanthropology defines the human. Human symbolic behavior in early humans is traditionally seen at work in tools, artifacts, technology, cultural practices, and art (cf. 177, section 6.1, for a much-discussed list of seven characteristics pertaining to such phenomena). But nevertheless intentional symbolic activity cannot come before the capacity (in Aristotelian terms, the “potency”) enabling it, as Purcell notes (181, section 6.2). Hence we cannot avoid posing the question of “a punctuated speciation event” (184, section 6.3). Whatever that might have been (Purcell does not discuss it, but I myself would favor the hominization hypothesis of René Girard), that event would have “made our immediate precursor at least potentially capable of symbolic thought”, and it seems inescapable that “the principle of exaptation, or correspondence” (184), must have been involved, in order to motivate the difference beyond mere degree to difference in kind. Purcell points out that scientists often pre-empt boundary questions about human origins from being raised, because the problem acutely illustrates the limits of the scientific method (185, section 6.4). But this is not a good reason for shrinking from pursuing the task with the help of philosophy (or revelation), and so Purcell launches into further exploration of the boundary distinguishing the human with the rest of book. In Chapter 7, he further explores the “material foundations for human consciousness” (190). He notes the “biological unity of the human family” (195, section 7.1.3). Unusual in comparison with the rest of nature, there is the “extremely unspecialized human infant body” (196, section 7.2). Moreover, because “the brain is dumb” (198), we must admit something else as “the higher synthesis to the lower material manifold,” which in Purcell’s opinion is the combined function of symbolization and language as “the principle of correspondence” in action as the “Aristotelian” form to the lower matter (205, section 7.3). Thus, while the “three preconscious factors” (207) are the material factors discussed in Chapter 7 — namely, (1) our species’ genetic unity, (2) our unspecialized bodies orienting us towards culture, and (3) the material potential of the human brain and vocal tract as eminently suited to higher-level organizing — the higher formal organization will be more suitably described with a less conventionally scientific and more philosophical approach, as Purcell proceeds to make clear in Chapter 8. A 34,000-year old horse figurine can evoke the abstract essence of horse. Hence Eric Voegelin articulates “immortality” and other such symbols (technically existing as entities in the mode of “non-existence” in the world) as being precisely that which can “convey a truth experience” (210) that cannot be understood unless we have an equivalent experience. To those who would deny such a “transcendent orientation,” Purcell quotes Lonergan on “the principle of the empty head”; namely, “the presumption that the interpreter doesn’t need such prior experience in order to understand equivalent experiences” (213 n.63), and this seems a suitable response to those who would deny this distinctively human feature (i.e., the awareness of “an existence that’s not the same as perceptible existence but beyond it,” 210 n.58, whether that be the abstract essence of horse or the immortality of one’s own person). Purcell gives an extremely helpful overview of Voegelin’s thought on human symbolic forms (214–9, section 8.1.4) that complements Aristotle’s definition of the characteristically human as “a quest for truth” (218). Hence the reader is able to realize that Voegelin’s “principle of equivalence” expresses how both myth and philosophy, for example, can function as different modes of the same “quest for truth”. Unavoidably, then, “the reality of experience is self-interpretive” (219), since it is we who are on the quest who wield the symbols. Purcell reviews the evidence of the earliest human symbols from Sungir (Russia), Pinnacle Point (South Africa), and Blombos Cave (222–4). These symbols point to the awareness of “non-existent reality,” i.e., to the awareness of “transcendence,” and with this knowledge clearly in front of us we can appreciate Purcell’s subsequent discussion of how language “derives from our relationship with Being” (226), which is the Heideggerian or (better) Voegelinian way of philosophically articulating our fundamental human awareness of the transcendent as beyond the immediately sense-perceptible. The origin of language is thus unavoidably a philosophical question (section 8.2.1), even if it must take into consideration the reality of exaptation (227) or mimetic behavior (228). Derek Bickerton’s emphasis on the syntactical seems to point to a much better explanation of the revolution in human cognition than gradualism can provide (229). In this way, language as an exaptation (Lonergan calls it a “sublation,” 230) is an ability that emerges from a pre-existing material potential: “Sublation characterizes the relationship between higher and lower levels in terms of correspondence and emergence” (230 n.104). But the indispensible requirement is nevertheless “human subjects operating in an interpersonal context” (233, section 8.2.2). In other words, the material conditions are submitted to a formal (i.e., higher), interpersonal dynamic. In Chapter 9, devoted to the highest personal characteristics of “understanding” and “freedom,” Purcell begins by considering the biological determinism that goes by the name of “sociobiology” (244, section 9.1.2). With the help of Lonergan, Purcell points out the limits of this sociobiological approach. Because we “live within our awareness of the truth,” any determinist denial of that awareness becomes “a performative contradiction” (246). In short, to argue that sociobiology is true is to refute it. Purcell also helpfully summarizes and refers the reader to Lonergan’s essay “Cognitional Structure,” which concisely restates the achievement of Lonergan’s 700-page plus magnum opus, Insight, on the distinctive nature of human understanding. Human self-knowledge is a “reduplicated structure” (248, section 9.1.3), which calls to mind the earlier discussion of the uniquely syntactical organization of human cognition (229). The opposite of “understanding” (or of “insight”) is what is responsible for what Voegelin calls “the eclipse of reality,” namely, the “enemy against which there is no defense: stupidity” (255). In the face of this perennial enemy of humanity, “the real test of freedom” is passed with flying colors by those who “lose their lives for the sake of a good which is greater than mere survival” (258, section 9.2): namely, those who thus testify to Voegelin’s “reality of the non-existent,” i.e., the reality of human transcendence. Purcell names names: Socrates, Thomas More, and Sophie Scholl. Part of what makes his book so well suited for use in a classroom context is that brief video clips illustrating Purcell’s named examples can help generate good discussion about the transcendent reality of “freedom”. When I used the book in my Human Person seminar, we watched an excerpt from the first hour of the film Sophie Scholl: The Final Days to bring up to speed those students who had not heard of her. The ensuing discussion was one of the highlights of the course; I made sure to end our introductory viewing excerpt right after the point at which Sophie, alone in her prison cell, prays her prayer. Purcell has written a highly readable book that can appeal to many readers. It is unusual for the way in which it intelligently treats of so many specialized topics. I highly recommend it, based on my own experience, for any philosophy seminar. While I used it as part of a Human Person syllabus, I think it would work equally well in Philosophy of Science courses and Philosophy of Religion courses. Purcell’s intellectual breadth and generosity of spirit invites readers and students to aspire to be their best selves. The book is full of nuggets of wisdom about reality for them to ponder. These nuggets work especially well when the students have not heard them before: for example, the uncomfortable reality that “the line dividing good and evil cuts through the heart of every human being” (Solzhenitsyn, quoted at 267–8). Or, the uncomfortable reality that the people “freely denying freedom” (264) are mindlessly amputating their own distinctively human potential. Or, the uncomfortable reality that to give in to the temptation to “slide away into unfreedom” (267) is to squander the core reality of human freedom as “lived unselfishness” (265, section 9.2.5). The remarkably distinctive human characteristic is that “we choose to choose” to have truth live in us. Purcell quotes Kierkegaard on this, but in the hands of a good teacher, this book can also be readily supplemented with an abundance of other materials (Chapters 10 and 11 point in many interesting directions if a teacher needs prompting; a syllabus that includes this book as part of a broader effort to rescue students from the culture’s stultifying scientism will offer them solid intellectual nourishment). For my part, after presenting the material of Chapter 9 (on Kierkegaard and how “we choose to choose”) in the third week of my seminar, I would enjoy citing Neil Peart’s lyrics for a famous Canadian musical ensemble: “If you choose not to decide, you still have made a choice” (Rush, “Free Will,” Permanent Waves). To professors, based on my own rewarding experience, I recommend adopting this well-written and immensely learned book as a required course text for upper-level philosophy seminars. For such seminars, it makes an excellent conversation starter and conversation sustainer. For the intelligent general reader, I can endorse this book as a splendid introduction to, and uncommonly serious reflection upon, the essential philosophical issues at stake in our culture’s scientific quest for human origins. Also see excerpt of the book here and Glenn Hughes’ review here. Christopher S. Morrissey is a Fellow of the Adler-Aquinas Institute and lectures in logic and philosophy at Trinity Western University in Canada. He is also the managing editor of The American Journal of Semiotics and author of "Hesiod: Theogony / Works and Days" (Talonbooks, 2012).